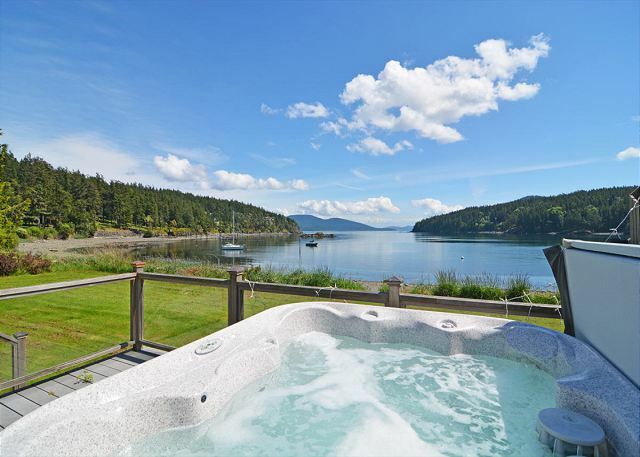 Super Waterfront Vacation Rental on Orcas Island, Hot Tub, Dog Friendly, Buoy! Vacation rental house. Sleeps 10, 4 bedrooms, 2.5 bathrooms. Dogs allowed. Welcome to A Sailor's Rest! 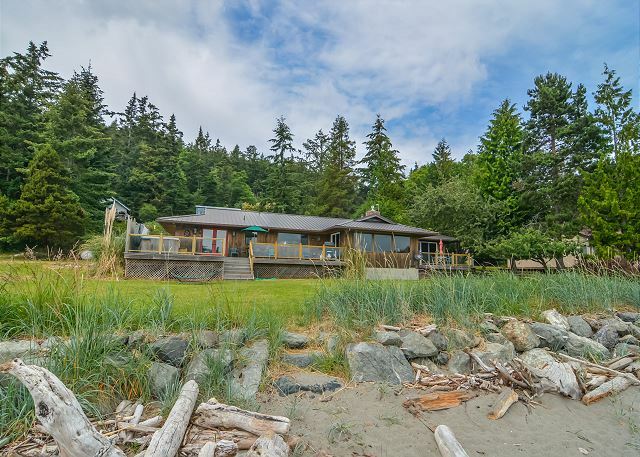 One of only a few homes on the island that you can walk out onto a sandy beach! You can't ask for a better set up than this! Another view of the deck. A beautiful beach to enjoy. Obstruction Island is viewed directly across the channel. The main living room with fireplace and two couches. No that's not a TV... that's your view! The dining area opens to the kitchen and is adjacent to the living room with views of the beach. 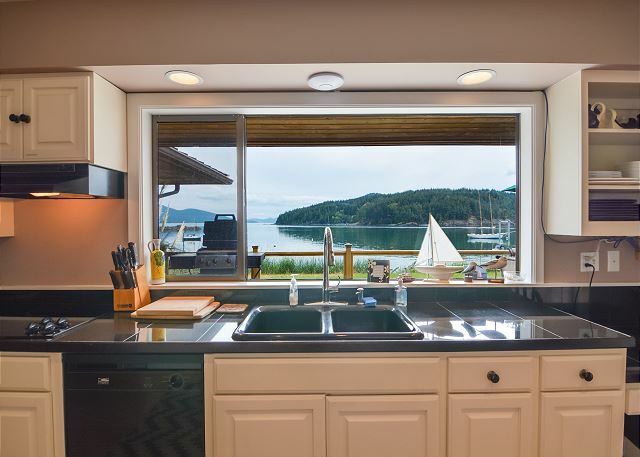 You might even like doing dishes on your vacation with this view. The bathroom off the hall outside the bedrooms. 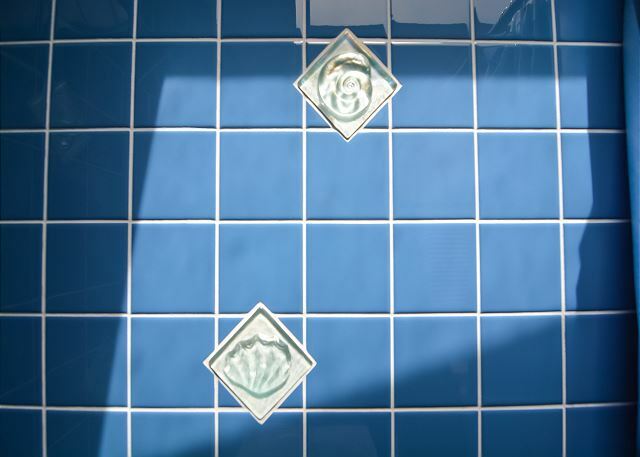 Beach themed tile work in the shower. A queen size bed in the guest room. 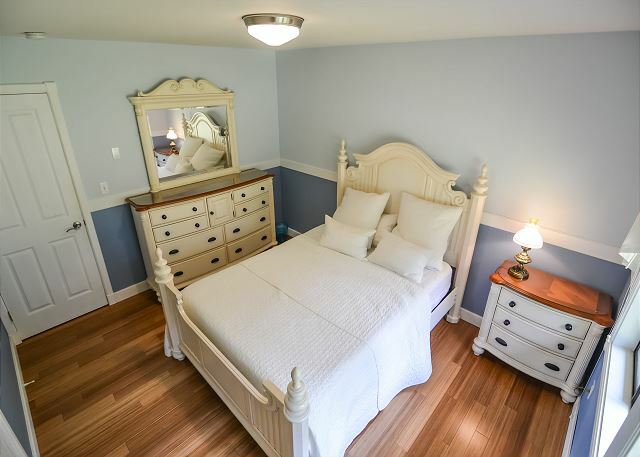 This room has been remodeled and exhibits a beautiful island charm. An up close view of the bed and night stand. 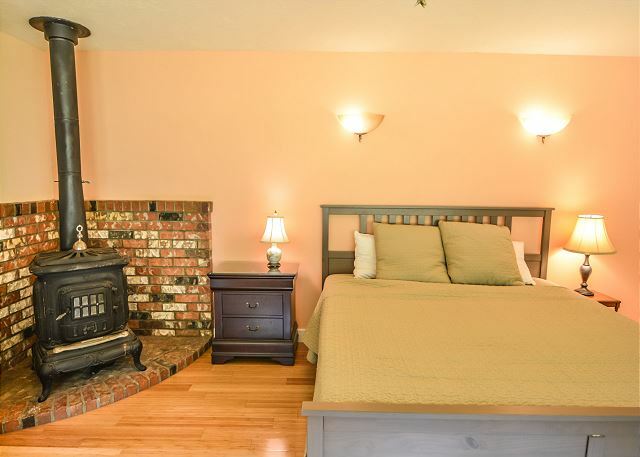 The master bedroom features its own fireplace and a spacious king size bed. 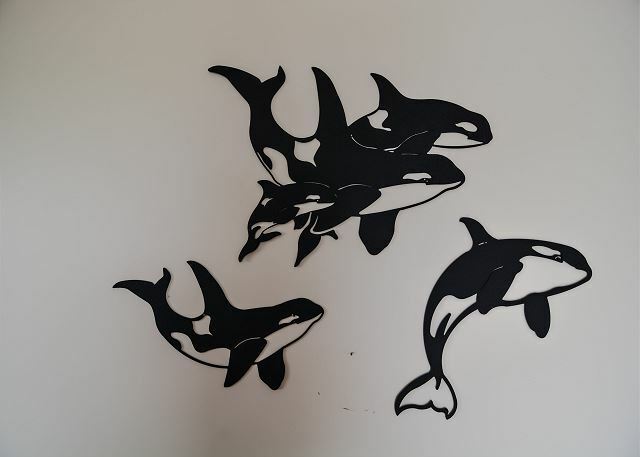 See if you can find these Orcas after you arrive. 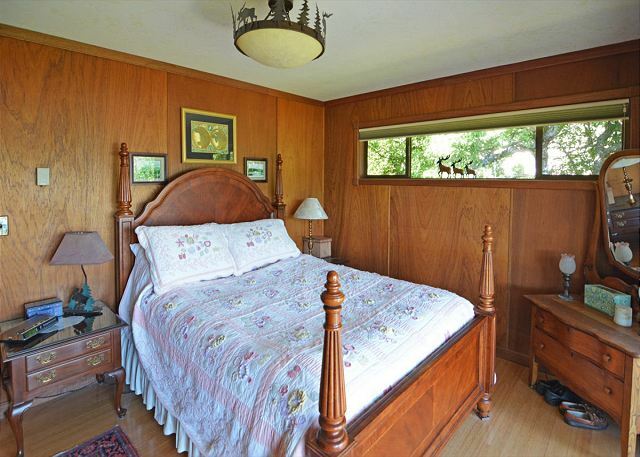 This bedroom has a queen size bed and offers beautiful views while laying in bed. The view from the bed. This room also has its own private porch. Detailed tile work of a Blue Heron. 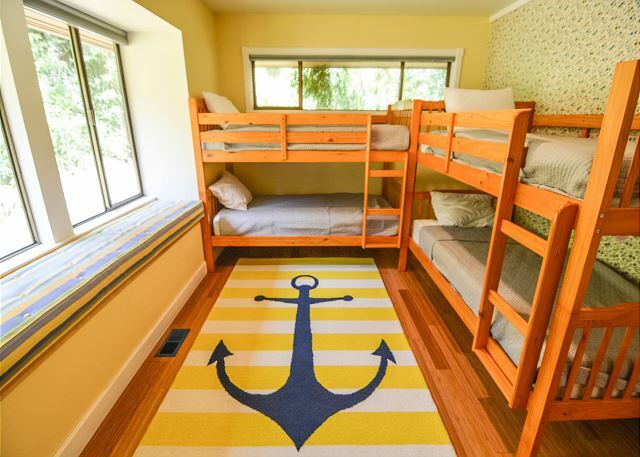 This room offers two bunk beds and is a whole lot of fun for the kids in the group! Custom wood work on the living room hearth. There is sure to be someone in your group who will spend their whole stay right here. 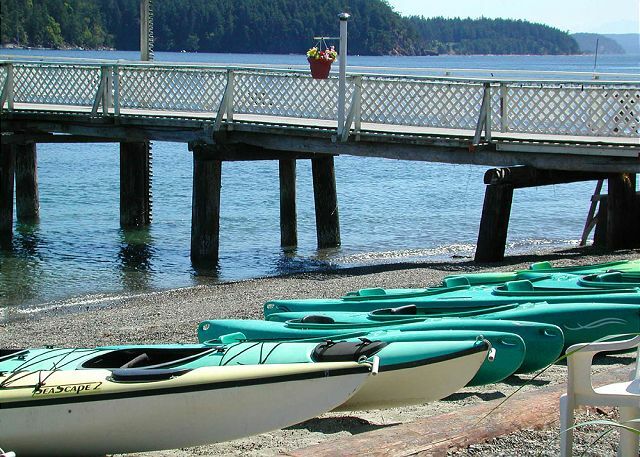 Walk a short distance south down the beach to rent a kayak from a local resort. A great spot for a summer nap! We hope you have enjoyed looking at A Sailor's Rest with us. Here is a last picture we like a lot - a sailboat resting right off shore in front of the house. Your family can wade in the island waters, launch kayaks from the beach, play board games by the fire, and make memories that last a lifetime in “A Sailor’s Rest.” A boat mooring buoy may be open for guest use but you will need to confirm suitability for your boat and availability when making your reservation. 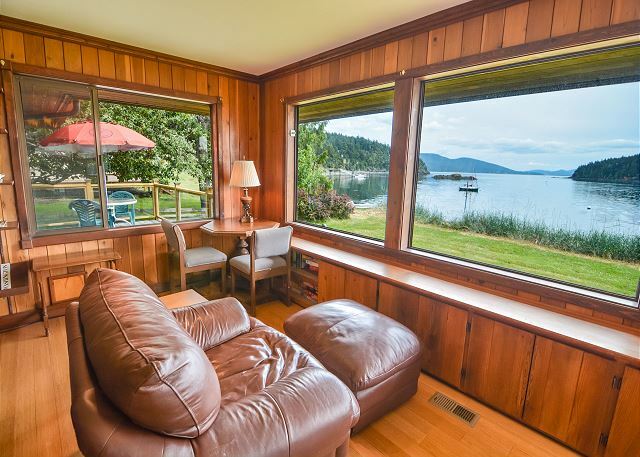 This charming Orcas Island vacation rental home has been remodeled and updated for comfort, yet it retains a classic island feel. 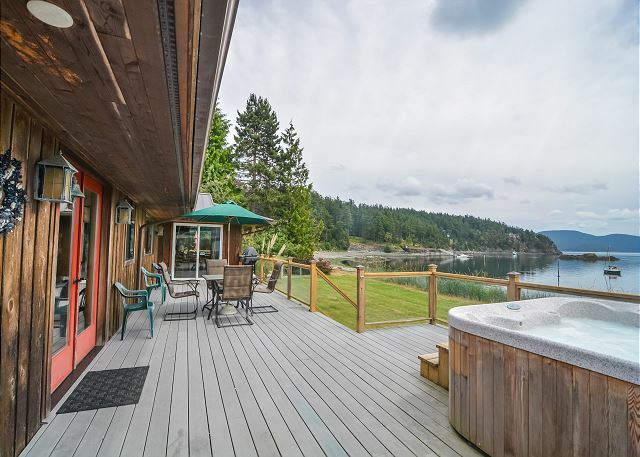 While the house itself is delightful and cozy, you will likely spend a lot of time outside breathing the clean sea air, dining on the deck, and soaking in the hot tub. 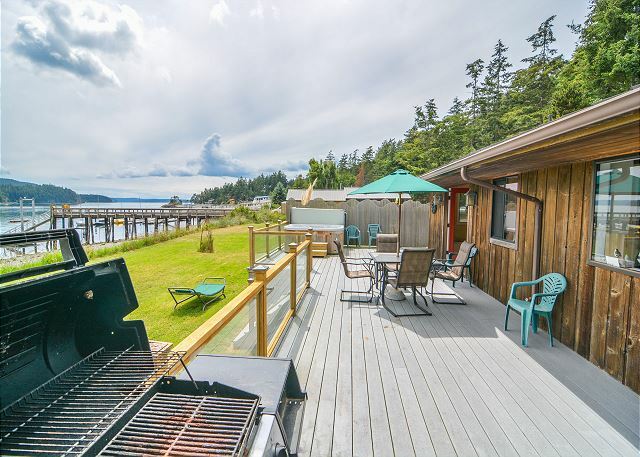 Located right on the beach, there is a spectacular view of the Olympic Mountains, neighboring islands, and the passing boat traffic. 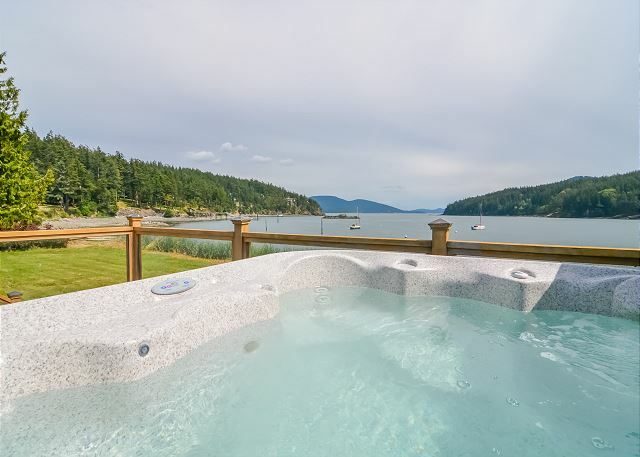 This is what vacationing in the San Juan Islands is all about. The configuration of queen and twin beds will accommodate a variety of guests and age groups. 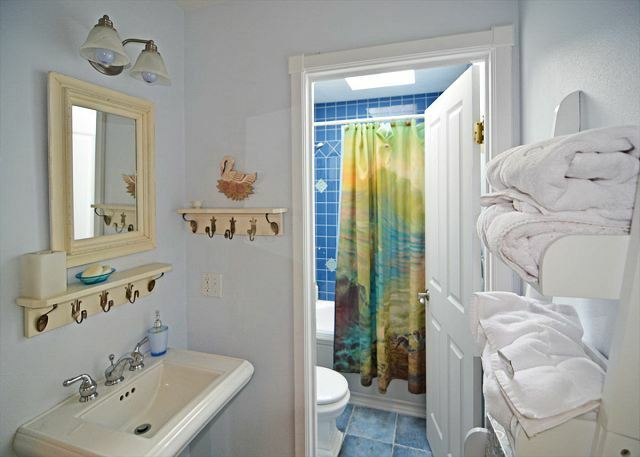 The master bedroom has its own pot-belly stove and private tiled bath with a whirlpool tub. The kitchen is equipped with the basics, but you might consider bringing specialty cookware if you will be preparing a special meal. A Sailor’s Rest is located in a neighborhood of similar beach front homes in Olga. 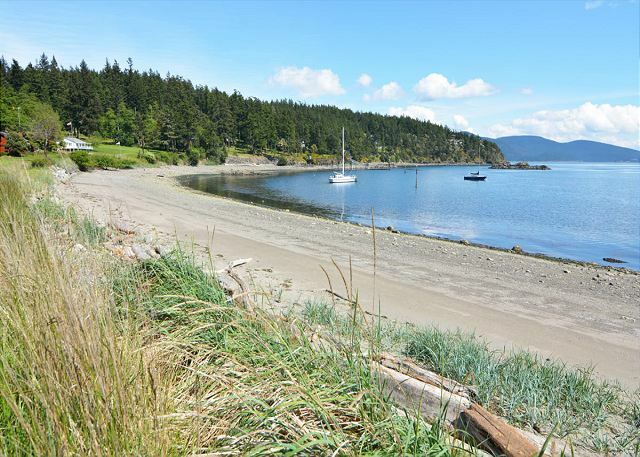 Your beach is posted as private property and a public day-use dock and boat ramp are nearby. Driving from the ferry landing it is about 40 minutes to A Sailor’s Rest, during which you will drive through Eastsound Village and the forested hiking trails of Moran State Park. In addition to the shops and dining options in Eastsound, there are also several restaurants and shops in nearby Olga, Rosario, and Doe Bay. PLEASE BE ADVISED. Parties are not permitted under any circumstances and the guest occupancy limit will be strictly enforced during your stay. Please note that if you are bring a pet the damage waiver is not applicable. The full security deposit is required. The home was very well appointed and comfortable. It has an interesting layout, in that the 4 BRs and 3 BAs are split into two sets of BR/BA groups. But this turned out to be just perfect for the two families that were staying there. The hot tub had an issue during our stay and there was someone there to take a look within a day and they were able to fix it. Great!!!!!!! We were a party of 10 and enjoyed the location and house to its fullest. This is a fantastic property. Great spot for families, kids, and groups. We loved the location and the house. Property management was very responsive to all inquiries and requests. Everything at the house was ready for guests, the manager was very helpful, and the house was comfortable for our group of 12. Relaxing Week at Sailor's Rest. 'Sailor's Rest' in Olga was a wonderful place to make our homebase on Orcas. We had 3 generations sharing the home for a week and the layout was such that we all had our own space and were very comfortable - the little one was able to go to bed early and have a quiet space while the adults could stay up late and enjoy the amazing view and hot tub. We would definitely return for another vacation. Great location and great house. Second year with 3 generations enjoying this great house over Memorial Day weekend. Perfectly set up with bedrooms in two wings. Love sitting on the big deck watching kids play on the lawn or beach w beautiful views. Unusual rental in that there is plenty of room at the dining table and enough chairs on deck for all to enjoy together. And the dog was in 7th heaven! We’ll be back next year if still available (property is for sale). Relaxing and quiet area. Wouldn't recommend if you want to go to town everyday. House had great amenities. Clean and welcoming, would highly recommend. Even though it is next to a public marina the property was nice and quiet during the October weekend we visited. It was kept very clean and up to date. Very happy with our rental we will stay again. Visit to Orcas Island and the house were great. 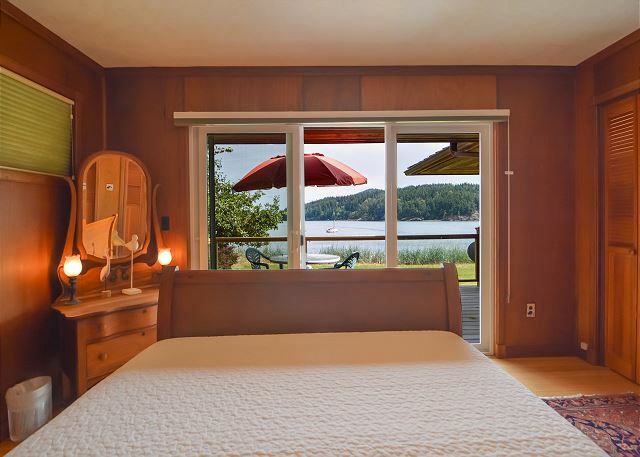 My only criticism/suggestion would be the extremely squeaky bed in the bedroom facing the water. It is bad enough that it prevents a good night's sleep and should be fixed. The home was as described. It was overall clean, though the sheets on one of the twin beds seemed dirty with grass (we just didn't sleep on this bed). I'd recommend this home. Top notch and a perfect home for a larger group, serene setting with easy access to many nature filled locations! We were at A Sailor's Rest for a family birthday celebration with 3 generations and loved it. The house is as far away from anything as you can get on Orcas...but still only 15- 20 minutes from Eastsound. Great for us but might not work well if guest wants to go out to dinner, hang in shops etc. Nothing in the least bit fancy but completely comfortable inside and out. Bedrooms are separated two and two off living room with doors to each "wing.". Although next to the county dock, even over a long weekend there was not much activity and we felt relatively private. Great place for kids and a dog with large deck, good sized lawn and beach. Only complaint was lack of any decent knives and small dining table for 6 (we squeezed 8 as two were kids). This is a gem of a place! The kids, the dogs and the adults loved it! We just wish we could have stayed the whole week. We had a very nice time sharing this house with some good friends. The location is great. We arrived by boat and used the county dock daily to pick up people with our boat that we moored overnight on the mooring bouy. The house is spacious and the deck is sunny and warm. Boating, bike riding, hiking, and wildlife viewing were just some of our activities. We were delighted to spend 4 days at Sailor's Rest--wish it could have been longer. We were there with our kids and grandkids for our 50th wedding anniversary. What a great house! Spacious, two bedroom wings gave us privacy, jacuzzi was a hit, walking right down to the beach with our paddleboards was so convenient. The kitchen had every gadget we could have wanted, too. Loved everything!! This place was absolutely amazing!! The view was stunning!! Upon arrival, I was a little worried about privacy due to the fact that there is a marina literally right next door but I have to say for the most part, we felt very private. Sitting in the hot tub or lying in the hammock, we were all very relaxed. I loved that this property allowed dogs as my two Chesapeake Bay Retrievers absolutely loved that they could swim and then chill in the grass as they dried off. Our family of 4 adults and 4 kids all felt comfortable here.....we will definitely be back!! 4 nights here was just not enough!! My one and only complaint is the bed in the bedroom with a view & patio. A new frame or something is needed....you can't even turn over in bed without a huge creaking sound. I have to say that after spending 4 nights on this bed, at no point in time did I get a good nights sleep. (This is the only reason I gave 4 stars for quality of furniture). Because of this, there may have been a nap or two in the hammock LOL. What a lovely spot for a family vacation This house was a perfect setup for our family. Loved the view, hot tub and of course the resident deer! This home was spacious for 7 guests and due to the distances from restraurants having a large and well-equipped kitchen was great. The home was clean, it is stocked minimally with paper-goods (a little skimpy for the price we paid) but other amenities and beach towels were appreciated. Best of all, it is right on the water with a small pier next door so lots to watch but quiet. The hot tub was clean and worked well, a hit with the kids and grandparents. 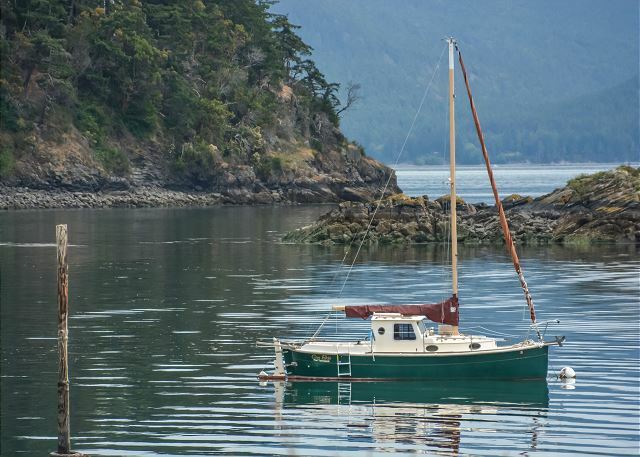 I took a private half day sailing lesson at Orcas Island Sailing, with Ben, and had an amazing experience. We brought our boat and enjoyed beautiful weather, a spacious house and fantastic views. We gathered at the large dining table for games and meals and on the on the deck for drinks and scenery. You won't need to bring much if you stay here. Just outside games/toys and food. Everything else was provided. What a delightful place to get away and rest! The view and the peace and quiet were incredible. The full moon shining on the water at night was like God's spotlight on the water. We ended up cooking most of our own meals as the kitchen was so well equipped and with the view, why leave? We took our two grandsons and their parents and had a great time! Mornings we sat on the beach to watch to boys play. Took a picnic to the lake for afternoon swimming. Hiked, biked... the hot tub was a terrific way to end the day. Great view! The staff had to bring us a few things and the windows needed washing, but we were very happy. 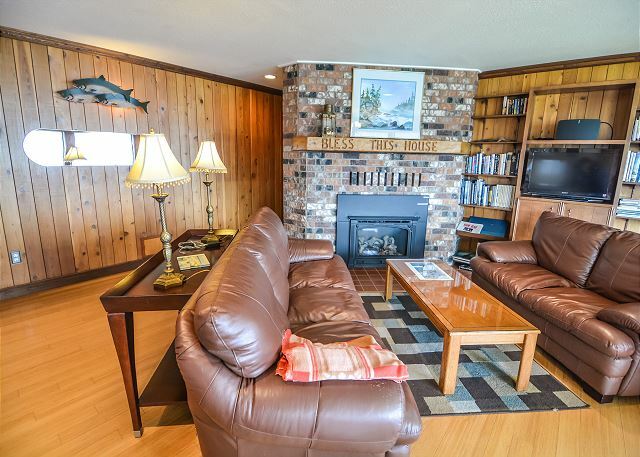 Perfect - south facing, lots of sun, spacious interior/exterior, fed deer out of our hands, bouy for my boat, well maintained home and the owners were super considerate. Hope to come back next year! Wonderful location, great views and very nice amenities. Have stayed here before and will always come back. We had a heavenly time staying at the Sailor's rest. The view is divine and the kids loved running on the beach. The house itself is spacious & comfortable. 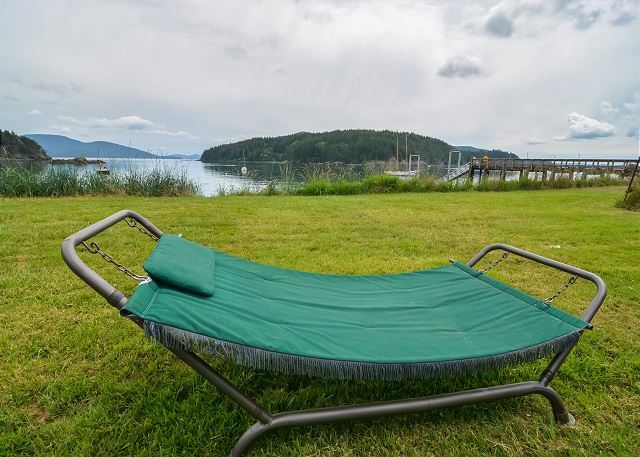 Location on Orcas island is terrific: very close to Moran State Park (which had wonderful swimming lakes, trails, playground, Mt Constitution) and not too far from Eastsound. Everything we were looking for...and more! Beautiful home, clean, open but private layout. Great boat and dock access. Everything we could possibly want was there....from utensils, to wading boots to towels. Deers and hummingbirds abound. Can't wait to come back! Awesome house with great views, convenient location, and plenty of space for a big group. A birthday celebration with 2 generations of family - 7 people and 1 dog. We had the perfect week. Together time, alone time, hikes, saunas, walks, beach, and meals on the deck facing the beautiful sound. We brought our own kayak which was used constantly in the mornings and evenings as the beach was easily accessible, and the waters calm (if you didn't go too far). A morning stop at Buck's Bay Shelfish and we were set for dinner. The weather was perfect - six days of sunshine, which the locals told us was not that common. Best location in Orcas. Great House, huge patio with hot-tub and incredible view of the sky. This house is very well appointed. We were 2 families and it was nice to have the bedrooms on seperate sides of the home. The view and waterfront access are devine! We brought our boat and found the public dock and mooring buoy to be quite handy. The home is quite a drive from any local stores or restaurants so bring your supplies! We would love to come & stay again sometime. The online photos, as good as they are, don't convey the beauty of the location or the high quality of the home. The view of Obstruction Pass/Obstruction Island is among the best in the San Juans. Of all the vacation rental homes where we've stayed, this was the best equipped, with everything we needed in the kitchen and a great grill. The WiFi is poor, and Verizon cell service isn't available, but that may be just what you want when you're on vacation. Loved the house. Our 3 year old's favorite thing to do was to walk to where the barges came in and see them loading and offloading cargo. The only reason I only gave it 4 of 5 stars on the location was that it was a little futher from the grocery store than I would have liked. On the other hand, I think many would have appreciated that remoteness. Overall, a great place to stay. My in laws want to know when we our booking our next trip. Perfect location, wonderful and warm home and everyone enjoyed the hot tub immensely. management was very apologetic and gave us some vouchers at the local bakery. This is a great place to stay, an amazing view, lots of comfortable rooms. The kitchen was out of dishwash gel so we had to drive into town our 2nd day but staff was helpful solving that, and also helping us in other ways during our stay. Delightful views and superb accommodations for two families. This is a great location with all of the amenities you could want. The buoy for the boat was greatly appreciated, although a private dock would be ideal. 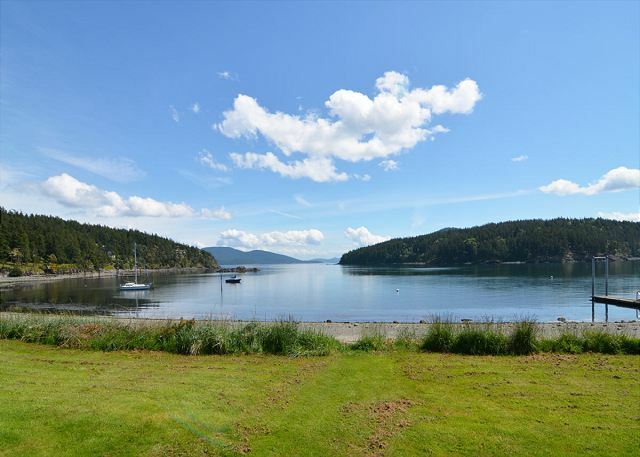 Orcas Island has too much to offer for just a one week visit, so we will be returning next summer. bbq looked like it fell off a truck. also made it interesting to cook on. Everything else was wonderfull. We took family to this fantastic home in a delightful location. It had everything we needed including a fantastic view of the harbor, Obstruction Pass, kayak rentals next door, Bald Eagle sitings, and deer on the lawn! The house itself is beautiful with a nice open kitchen/living room layout. Perfect for entertaining. There's a nice large deck with a hammock and hot tub. We enjoyed congregating there for coffee in the morning and cocktail hour in the evening. The hot tub was touchy with the controls but the Owner came right over to help fix it. I highly recommend this rental! The house is just to good to believe. We have so much quality time with each other yet, there is always something for each of us to do alone if we want. I hope the house is avalible next year.